Sergeant James Gaskell 11th Battalion East Lancashire Regiment. James Gaskell was born in Chorley, Lancashire. He enlisted in The East Lancashire Regiment (The Chorley Pals) on the 15th September 1914, giving his age as 19 years 8 months, and his occupation as weaver. On the 1st July 1916 his battalion suffered terrible casualties in the Battle of the Somme. In less than twenty minutes, 235 were killed, 350 were wounded. James Gaskell was not with the regiment on that terrible day- he had been admitted sick and moved from the Somme battlefield to a hospital in Rouen and then to the Beaufort War Hospital on the 22nd of June. His medical record states that he was suffering from ulcers, cellulitis of the legs. 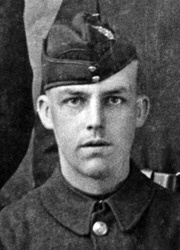 He returned to France with the 7th Battalion on the 14th November, and rejoined the Chorley Pals a month later. He was appointed Lance Corporal in January 1917, promoted to Acting Corporal in May the same year. On the 13th November, he was gassed when a shell hit the Battalion headquarters at Fresnoy. He was treated behind the lines and shipped back to England to the Northern General Hospital in Lincoln. James Gaskell married Clara Harter on 20th May 1918, returning to France on 6th June. He survived the war and was discharged from the Army in January 1919. We acknowledge the excellent Chorley Pals Website for James Gaskell’s story. http://www.chorleypalsmemorial.org.uk/. His Service Record is also online although there is little documentation about his time at The Beaufort.